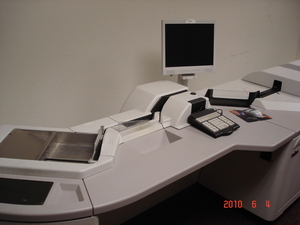 Unisys Quantum 600 Check Sorter complete or with parts, we also carry a wide variety of sorters and parts. Whether you are looking for complete check sorter or parts, contact us. Complete unit has image module and main cabinet. Call for pricing and configuration you need. We have a few different units and we can configure them to your liking. Many parts available call or email us for more information. call Mario (408)846-2708 or email mfaris@aol.com.